Dakota has been a loyal dog to her owner Ryan Revoir for the past eight years, but the Revoir family almost lost her when she was diagnosed with Osteosarcoma. A tumor was growing in the dog's left foreleg. “I took it almost as a death sentence, you know you hear the words cancer, it’s never good you know that's most of the time not a positive outcome,” said Revoir. The amputation of Dakota's leg would not have been enough to treat the cancer. There was a chance it could have spread to her lungs, so she also received treatment from Elias Animal Health in Olathe, Kansas. 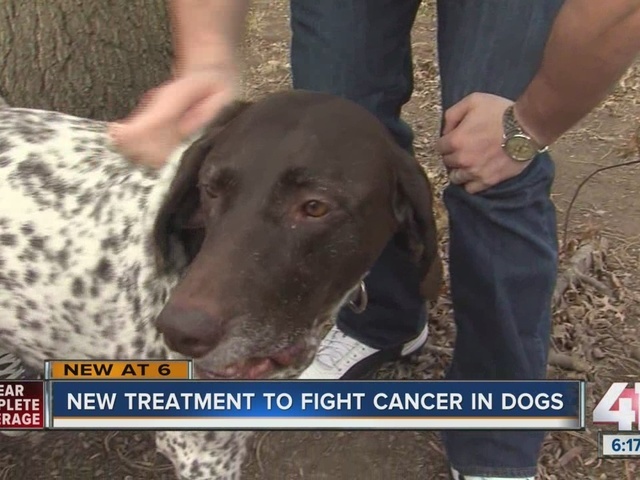 Elias Animal Health is the only company in the United States to develop a new type of treatment for cancer in dogs. The treatment takes both good cells and bad cancer cells and creates a vaccine — in a sense teaching the good cells to fight the bad ones. "Then we can take those now educated immune cells, bring them into our lab and grow them up into large numbers to give them back to the patient, which then creates an army, really of killer T-cells that are aimed directly at that patient's cancer,” said Tammy Wahaus, CEO of Elias Animal Health. This type of treatment occasionally has been used on people, and if successful on dogs, it could expand. Dakota is only 15 months past her diagnosis. There is no way to tell if she is fully cured but her family does get to keep her a little while longer. "She's back to being the same old dog she was before, it’s awesome," said Revoir. Dakota’s treatment was free because it was part of a clinical trial. Elias Animal Health is looking for around 50 more dogs to partake in free clinical trials. They are looking for dogs with Osteosarcoma and B-Cell Lymphoma. For more information on the company or how to get involved with the free trials, contact them through their website or Facebook page .